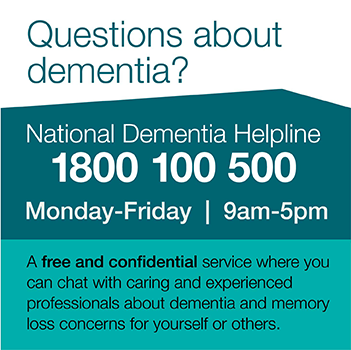 The National Dementia Helpline is a telephone information and support service. Our help sheets provide advice, common sense and practical strategies on a range of commonly raised dementia topics. Dementia Australia provides a counselling service for people with dementia, their families and friends. Our Living With Dementia Series provides people in the early stages of dementia, along with their families and carers, with a program of information, advice and peer support to help them to come to terms with their condition and plan for the future. This program provides customised information and support, to improve the quality of life for people with younger onset dementia. Our carer support groups provide an environment in which carers of people with dementia can discuss issues with other people in a similar situation. Our highly skilled educators offer specialised dementia education, sessions, and programs for family members and carers of people living with dementia. Throughout the year Dementia Australia delivers a range of seminars and other presentations to the community on memory loss and dementia-related subjects.